After months of planning the Ultimate Event it came and went last Saturday. It has consumed almost every spare minute I have had over the last few weeks and it will keep me busy for a few days yet clearing up. It was an amazing day. 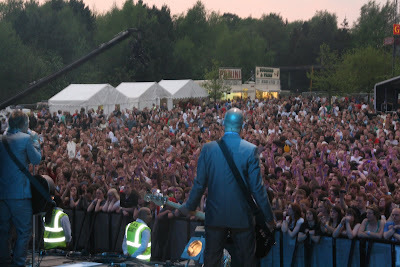 We ended up with 9400 people from all over the UK. We also saw scores of young people respond to thebandwithnoname invite to follow Jesus for the first time. We had one or two little difficulties with sound very early on but it did not seem to spoil the enjoyment judging by the feedback we have received. We will have some better footage once we hear from God TV but here is some quick footage of Delirious shot from hand held cam with not very good sound but you get the idea.